At Sound Division we specialise in premium entertainment for your very special day, whether it be a Wedding or Civil Partnership ceremony. We have extensive experience of supplying the best music and DJ services to create the right mood for you and your guests. 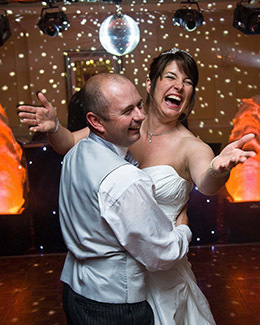 We feel it is essential to discuss details with you so that we fully understand your requirements, including the genre of music, your first dance, the type of lighting and what time you need the disco setup by. We believe in minimum talking during the evening (unless you wish otherwise), as our music does the talking for us. If required we can visit the venue with you, prior to the date, to finalise all the details and to give you peace of mind for your wedding DJ and entertainment requirements. We are not an agency and therefore do not pass on appointments to other Wedding DJs who may ‘happen to be available at the time’. This also enables us to offer very competitive prices, as agency fees can be a significant added cost. You will deal with us directly which is why your Wedding DJ requirements are in such good hands. Once we have confirmed the details for your wedding DJ and entertainment requirements you will be sent a booking contract and request sheet to complete. You will be able to list any particular music tracks you would like included and, if applicable, any which you do not. We are happy to include requests from your guests throughout the evening. If it is more convenient you will be given details how to submit this request form on-line. To book Sound Division to be your Wedding DJ, contact us today, and make your day an event to remember.